As of this morning, I'm at 250, a four pound loss for this week. Hooray! And - I hit a goal this week! Yes, it was a goal I chose simply because I like numbers that end in five and zero, but nevertheless, I met it! On top of the goal, I now have only five pounds to go for my hundred pound loss. I'm positively giddy, which is great, because I spent a lot of this week feeling wishy-washy. Between the stress of the beginning of the semester, adapting to going back to work after four weeks of vacation (and readapting to going to the gym an awful lot more than I did when I was in Connecticut), and all of the introspection that last weekend has inspired, I have been feeling odd - no appetite for a couple days, a nervous stomach ache, and tired all the time. I brought my gym bag to work on Wednesday with the intention of running, and I was so tired by 3:30pm that I just went home and laid around all afternoon, then went to bed around 9. In fact, I think I was in bed by 9:30 most nights this week! Now that I'm not a student, I tend to give in whenever I feel really tired like this - clearly this is what my body needs. Teaching has gone fairly well so far. I have three sections of the same course, which is terrific - only one set of lesson plans to do! I have taught this material before, but during an accelerated summer course where we did 16 weeks of material in 4 weeks, so slowing down and making sure they totally understand is something I need to work on. I'm very lucky to have a lot of students that were in my courses last semester, so the classroom atmosphere is already very comfortable, I think. Unfortunately, though, one of my sections has already established itself as the "trouble" group - not coming prepared to class during the first week of class is not a good sign for how the rest of the semester will go. 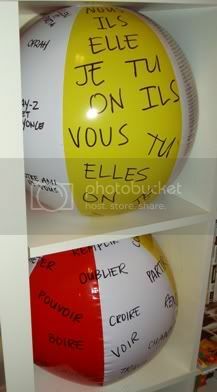 I'm optimistic, though, and tomorrow I'm bringing my subject/verb beach balls for some fun review. If a game doesn't get them thinking, what will?! Because this was the first week of classes, I have finally experienced my own wave of "resolutioners" at the gym. I don't mind, to be honest - last night it was really crowded so I ran on the track instead of the treadmill, and it was wonderful. I did 50 laps (3.33 miles) in 46:06 - not bad, considering it was my longest run since I did the 5k. I've been doing the recumbent bike, which I have never really tried before but I definitely enjoy. I have also been back in the pool a few times, but I'm taking a break from it until I get a new bathing suit ... mine from this summer is far too big. It was okay for a while since there's a skirt on it, but now it's so loose that I'm concerned about showing a bit too much! Woohoo! Way to go on reaching a nice "50" milestone :)I'm having the hardest time getting back to a normal routine after holiday traveling and revelry. You are inspiring me. I must run today (it's been a week)! You are doing great!! Keep it up!! I loathe resolutioner time at the gym. It's brutal... here I've been going to the new gym in town and it's just packed, it's massive and you can't even get a locker in it. I went on Monday night for a workout and had to wait for a cardio machine... which is insane because they actually have like 40 of them.